All right, gang, let’s delve into it a bit. I watched it this morning in the wee hours and felt swept up into the pilot with the first scene at the police station. Hearing Anissa's voice over of the #BlackLightning Oath, while Jennifer compares her to Harriet Tubman, established the tone of the show and what it was going to be. Then they give us a moment to breathe, and we see three of them as a family in the car, building an emotional hook for the audience. It gave me flashes of moments from my childhood, I have been in that car. The doubling down in the second scene with the cops pulling them over for a driving-while-black stop cemented a grounding the other DCTV shows have ignored: the reality of being black in America. This show would not just be about superheroes superheroing, but rather the cost of superheroing, knowing that powers can’t always save the day and the community. It was so refreshing to see a smart, respected black man excelling at his profession and winning battles with his words; to see the students at the school engage with him, his concern for them and talking down a gunman to make sure no one was hurt; and then doing something in more of a gray area by trying to deal with the local gang boss, a former student, to keep the peace. That's not to say there isn't superheroing, as the use of Jefferson’s powers are AWESOME!!! I loved the battling in the dark illuminated by lightning punches and bolts of power! As an African American father with a daughter, I instantly related to his motivation for quitting being a superhero and then reclaiming the mask for the same reason: his daughters. He would do anything for them. Don’t get me wrong, it’s not a perfect pilot. Pilots are difficult to pull off as they need to establish the protagonist, antagonist, the world, drama and numerous other bits in about 43 minutes. A hefty endeavor. There were some moments that didn’t sit right with me too, for instance, when Jefferson knocked out the cops behind the alley and blew up the police car. I could say he was covering up his tracks, maybe disabling the dash cam in the patrol car but that scene felt more forced, as did him standing on the roof of the motel at the end of the big fight scene. But such minor ticks are easily forgotten. 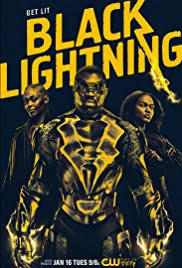 That said, Black Lightning is the best pilot of the DCTV shows followed by Arrow and Supergirl. I will be here every week watching this show and looking forward to the journey!